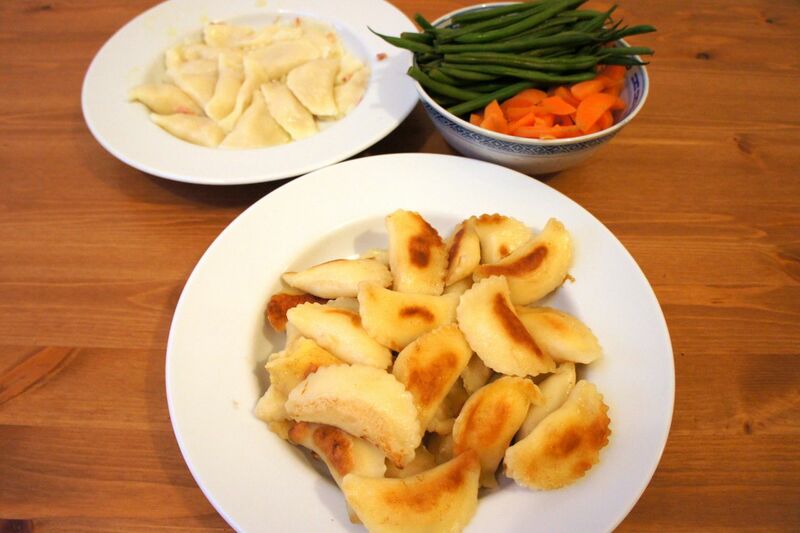 In any case, the ubiquity of perogies is such in Alberta that my Japanese mother regularly made them at home when I was growing up. 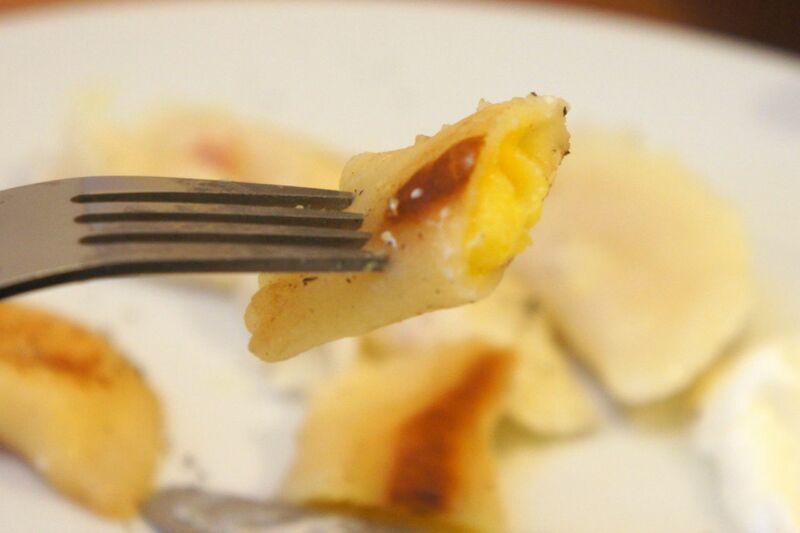 Oh, she didn’t make them from scratch – she brought frozen Cheemo perogies (which I still remember as the best brand; cheddar was the best flavour) and served them with soy sauce. Not traditional, perhaps, but really good. When I moved to Ontario for university, I was initially distressed at how much harder it was to find good frozen perogies. 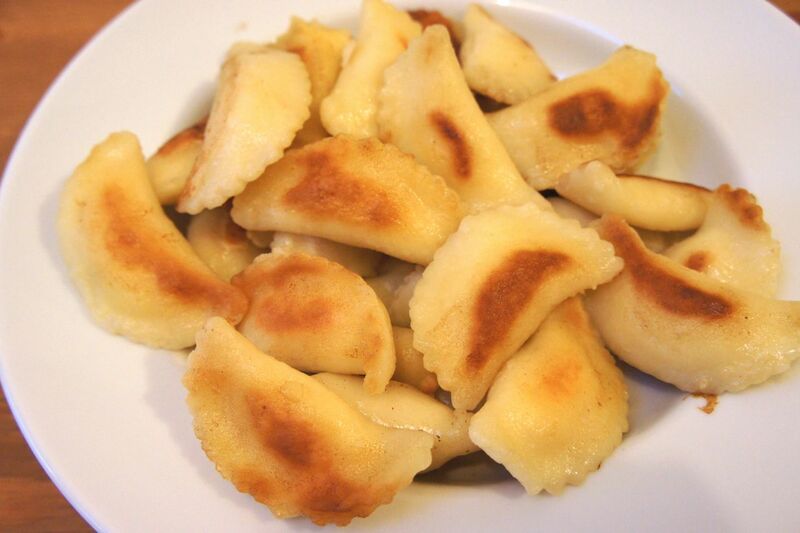 Then one day, my friend Susan (also a prairie girl) made perogies from scratch. They were a revelation. If frozen perogies were comfort, these were ecstacy. However, they were time-consuming, so I never did make them for myself, not when good frozen ones were becoming more readily available even in Ontario. When I went gluten-free, one of the things I missed most were perogies. I moaned about this for some time until I found some frozen but extremely expensive ones, whereupon I commenced moaning about the cost. 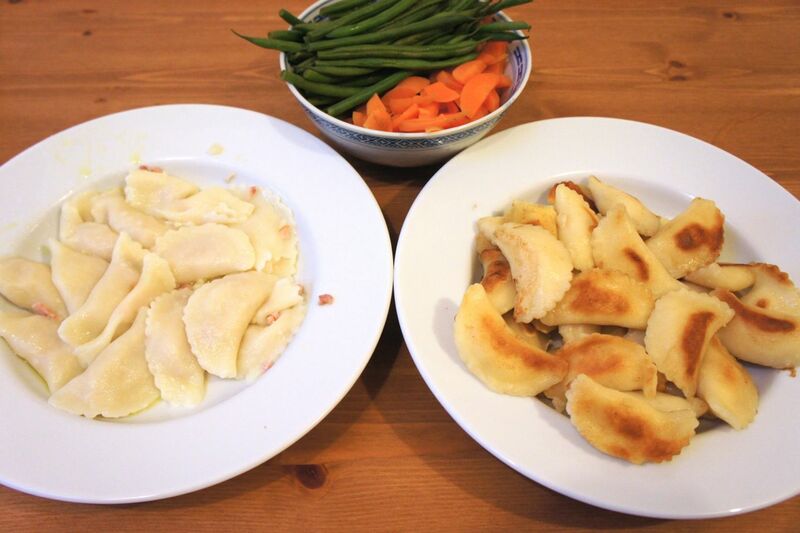 It wasn’t until I came to England, where nobody seems to have heard of perogies, never mind gluten-free ones, that I decided to try making my own. I don’t know why it took me so long. Although yes, it is time-consuming, it’s not especially difficult and if you make a large batch, you can easily make enough for two meals. Also, as I’ve always known, perogies freeze well. It did take me a few attempts to come up with exactly the right recipe. My first attempt resulted in a crumbly dough that was hard to handle and cracked a lot. My second resulted in a dough that tasted almost bready, not perogy-like. Then I hit upon using a mix including rather a lot of sweet rice flour, AKA mochiko, AKA glutinous rice powder. This produced a dough that was much easier to manipulate and had the right chewy texture. I suspect the tapioca starch also helps with this. The fillings are also important, so use high-quality ingredients. 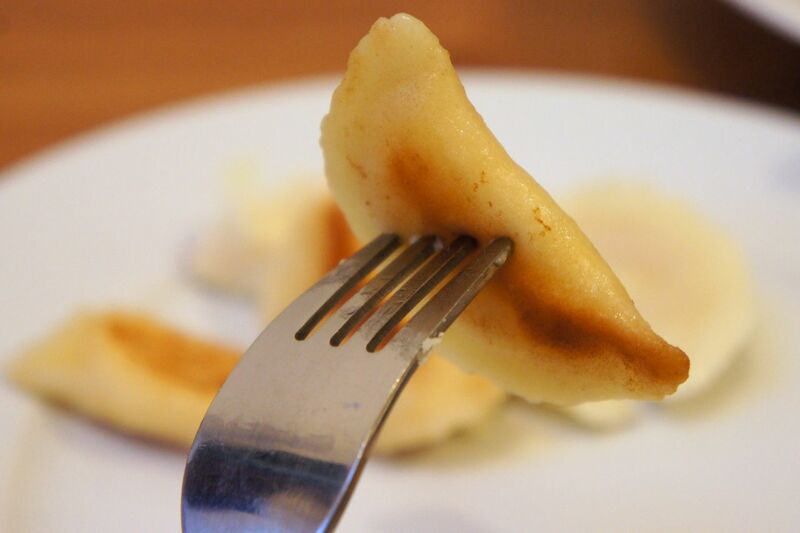 Most perogy fillings consist of mashed potato mixed with something but sauerkraut (not low-FODMAP) is another traditional option. I’ve even seen blueberry perogies, though, so you can use your imagination. My family’s favourite filling is mashed potato with plenty of cheddar cheese (use a mature, flavourful cheddar!) but the quantities I’ve given here are to make half the perogies cheddar and potato and the other half bacon and potato. Other common fillings include cottage cheese and potato (not low-FODMAP) and onion and potato (also not low-FODMAP). 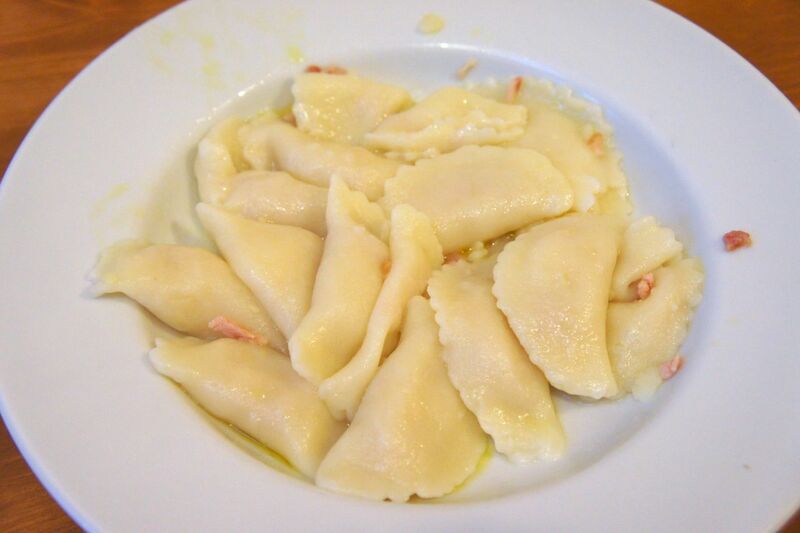 You may end up with some extra filling, especially if you make smaller perogies, but as far as I’m concerned there’s nothing wrong with that – just eat the leftovers as a side some other time. I am now about to share with you what is, as far as I’m concerned, the best recipe for gluten-free perogies ever. In fact, it may be the best recipe for perogies, full stop. Enjoy! In a large bowl, mix together sweet rice flour (mochiko), rice flour (brown, white, or a mix), tapioca starch, cornstarch (cornflour), potato starch, xanthan gum, and salt, whisking well to break up any lumps. In another bowl, whisk together the vegetable shortening, lactose-free soft cheese, and egg. Add in the lactose-free milk/almond milk and 1/4 cup cold water and mix well. Make a well in the dry ingredients and add the wet ingredients. 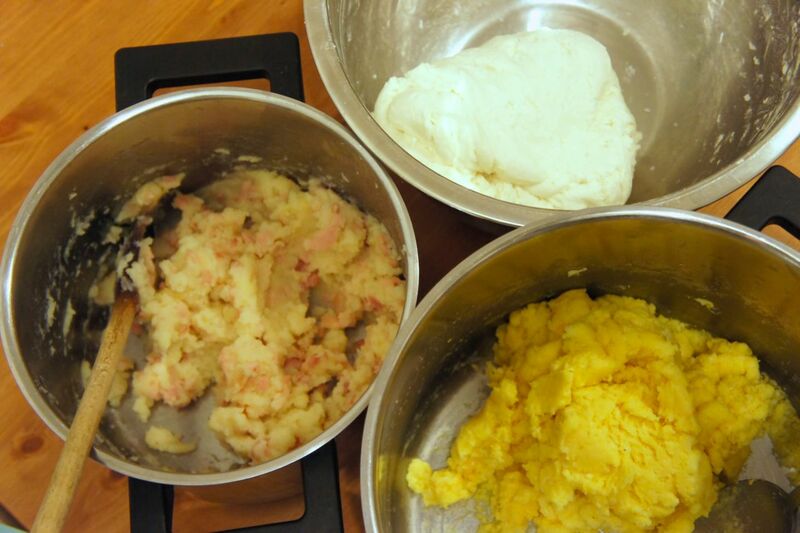 Mix well and knead until you have a smooth dough. It should be firm, not sticky, but not so dry that it’s really crumbly. If it’s too dry, add a little more cold water a teaspoon at a time until you have the right consistency. Don’t add too much! When I last made this I added just one teaspoon. Cover the dough with plastic wrap so it doesn’t dry out and let it rest for awhile. If you want, you can premake the dough and refrigerate it at this stage. Meanwhile, prepare your filling or fillings. If like me you want to make two flavours, divide up your warm mashed potato into two bowls. To one bowl, add the cheddar (and optional turmeric and paprika for colour) and to the other, add the chopped back bacon (you could use streaky bacon if you prefer but the result will be greasier). Add salt and pepper to taste and mix well. Dust your working surface with rice flour and take out a hunk of the dough. Using a rolling pin also dusted with rice flour, roll it out until it’s quite thin – nearly as thin as a wonton wrap but not quite; thinner than even thin-crust pizza, though. Use a glass, small bowl, or large round cookie cutter to cut out circular shapes (I used a cookie cutter with a scalloped edge but this is by no means necessary). Put them on a plate – they should at this point be well-dusted enough with rice flour that they won’t stick together, but you’d still be well-advised not to stack them completely on top of each other. Keep the plate covered with plastic wrap most of the time so the dough circles don’t dry out. You may need two large plates. Put a little cold water in a small bowl and put the bowl near your work area. 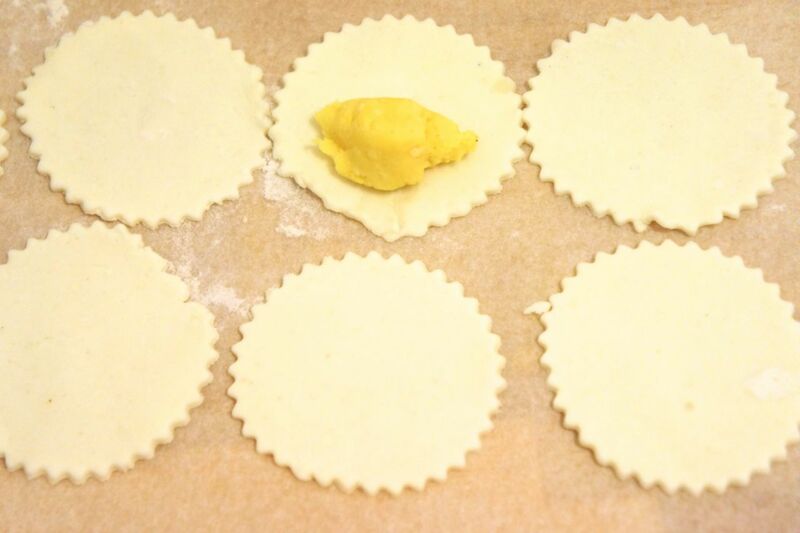 Pick up one dough circle at a time and put a bit of the filling in the middle. Just how much filling you use will depend on the size of your perogies, but my relatively small perogies used about a teaspoon of filling. 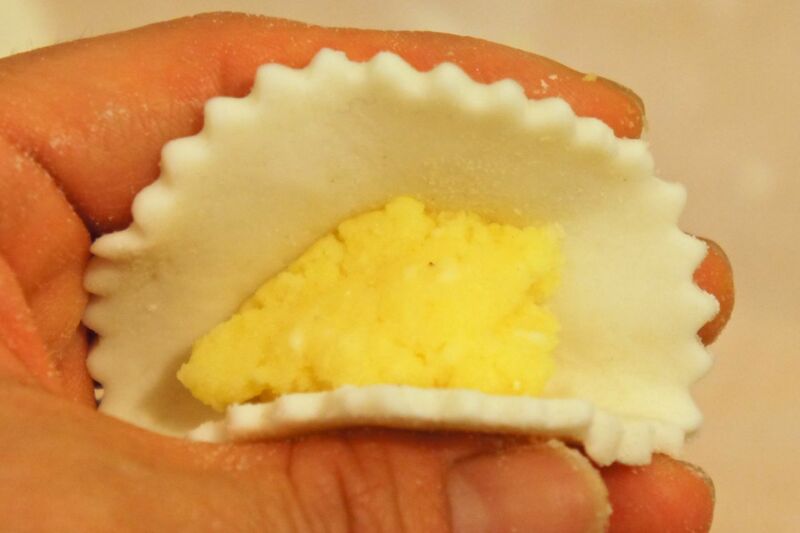 You want to use enough filling that you can just barely close the perogy without stretching the dough. Dip a finger in your water bowl and trace a circle around the inside of the dough circle. This will enable you to pinch the perogy closed and have it stay closed. When you have finished making your uncooked perogies, you can either cook them or freeze them. If you’re going to freeze them, put a piece of non-stick baking paper on a cookie sheet and plate the perogies on it without having them touch. Put the cookie sheet in the freezer until the perogies are frozen. Don’t forget them there, though – the longest you should leave them is overnight. Once the raw perogies are frozen solid, put them in a good freezer bag and return them to the freezer, where they’ll keep for a few months. To pan-fry them, take the perogies you have boiled (without oil) and pan-fry them in a bit of butter or oil until they’re golden brown on both sides. Yes, this means you have to flip them once. This is easier to do in a non-stick frying pan but it’s possible to use a cast iron or aluminum pan and a little water, like gyoza chefs do. Serve, optionally with sour cream or yogurt. These things are normally high in lactose (and therefore not low-FODMAP) but you can make your own plain yogurt using lactose-free milk if you can’t buy any. Or you can just use a tiny bit if you’re not that lactose-intolerant. Alternatively, you can skip the dairy or dairy-like accompaniments and just serve with pepper and/or paprika. Or hey – soy sauce! Why not? Other alternatives are to serve with real bacon bits and/or fried onion, if you’re not worried about FODMAPs. 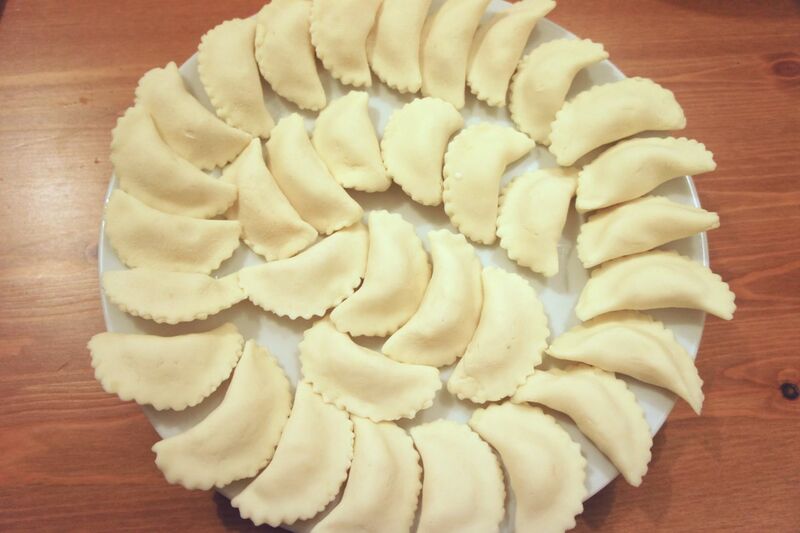 This entry was posted in European food, Grains, Lunch, Mains, North American food, Vegetarian and tagged Canadian, cheese, dumplings, gluten-free, low-FODMAP, mashed potato, perogies, perogy, pierogy, potato dumplings, pyrogy, recipe, Ukrainian, varenyky, vegetarian by karenyk. Bookmark the permalink.